It is essential for children to be fully immunised and we advice that current recommendations should be strictly adhered to. The practice nurses hold immunisation sessions each month with the health visitors, and a doctor is available for advice as required. Invitations to attend are sent automatically. 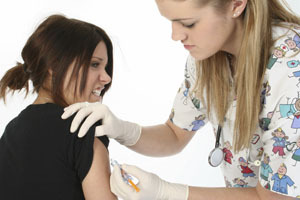 Are you eligible for Shingles Vaccination? From September 1 2015 the shingles vaccine is routinely available to people aged 70 and 78. You become eligible for the vaccine on the first day of September 2015 after you've turned 70 or 78 and remain so until the last day of August 2016. Immunisation against seasonal flu (the 'flu jab') is given every year to people at risk of developing serious complications from seasonal flu (influenza). If you have the 'flu jab' you greatly reduce your chance of getting seasonal flu. You should consider being immunised against seasonal flu if you are aged 65 or over or have certain diseases of the lung, heart, kidney, liver and nervous system. Immunisation against swine flu also began in the autumn of 2009. Priority is being given to 'at risk' groups. People who are not in the priority groups may be offered immunisation against swine flu at a later time. Pneumococcus can cause diseases such as pneumonia, meningitis and blood infections. Children under two are offered the vaccine. You should consider having the vaccine if you are over 65 years or have certain diseases of the lung, heart, kidney, liver and nervous system.